The Taranaki Quilt Festival is a biennial event that displays the creative work of members of the Taranaki Patchwork and Quilters Guild. Their skills are displayed in a number of sections. There is a general exhibition of work which is judged in various sections that include best use of colour, best quilting, best first time exhibitor and best in show overall. Other sections of the display include 'Modern Quilts", challenges such as "A view from a window", a monochromatic piece entitled "Reflections", "Come on board with textiles" and "Maudettes" challenge. Visitors are asked to chose their favourite work so an exhibitor can be presented with the "Viewers Choice award." Members are selling other pieces of their work at a stall and a variety of merchants will have their goods for sale in the Merchants Mall within the hall. Additionally there is an Aotearoa Patchworkers and Quilters exhibition entitled "Art Deco" being staged at The Percy Thompson Gallery. Three TPQ members had their piece chosen for this exhibition which is travelling around New Zealand. 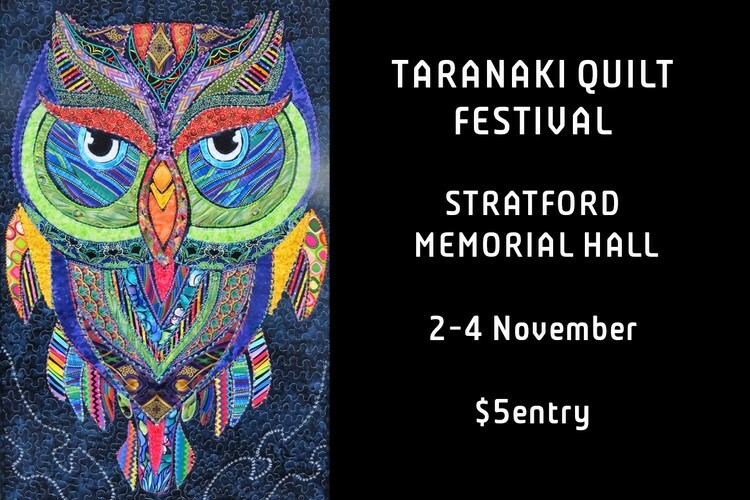 Come and spend several hours viewing the Taranaki Quilt Festival during the Garden Festival, so you can see another side of the creativeness of Taranaki people.